After 30 years of marriage, a couple has experienced a lot - both the joys and the struggles that life dishes out. At this point in time, it's no longer just two people living their lives together. Often it's about love of family - children and grandchildren, nieces and nephews, aunts and uncles. 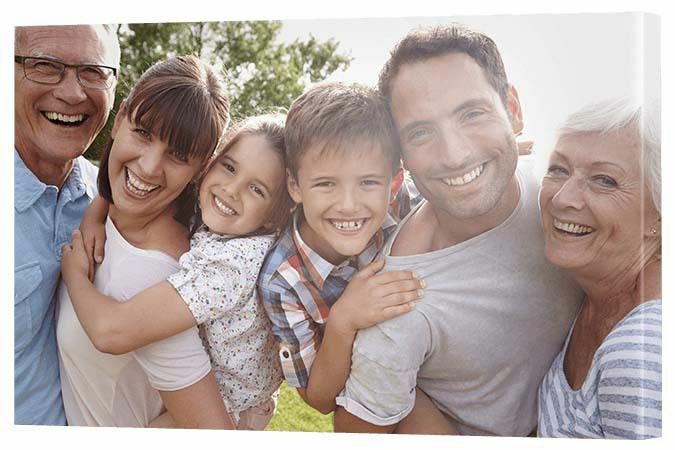 Love of family is now the one constant, so why not throw a big 30th celebration and consider 30th wedding anniversary gifts that recognize love, friends and family? A themed family canvas is just the ticket to celebrate 30 years of marriage, a wonderful gift for the happy couple. When reflecting on 30 years together, family will no doubt play a huge part. This gift is for the couple who have been blessed with a rich and giving family life. It's a great gift from family to celebrate the triumph of togetherness for the long-married couple. After 30 years together, you're still best friends. What is it that you love doing together? Have a think of your favorite shared activity. Do you love to walk, cycle or golf together? For the 30 wedding anniversary, print a gorgeous wall display featuring you and your spouse enjoying each other's company. To make sure you get the right set of photographs, it's a gift you'll need to plan in advance. If you'd like to make it a surprise, get a friend on board to carefully capture some of those moments. Alternatively, if you're comfortable letting your spouse know your thoughtful idea, you can hire a photographer and pretend you are models for the day! While it still only feels like yesterday, your amazing honeymoon was a special time for both of you. Why not bring all that love and passion back in a spectacular split image print? Printing on stunning glass will revive that old amazing photo, giving it a fresh, fun flavor all over again. Keep memories alive, just like your love. There are many reasons you may not wish to buy your partner pearls to mark this special occasion. Perhaps it's the cost, perhaps she doesn't like pearls or perhaps she's expressed she has enough pearls already (is that possible?). 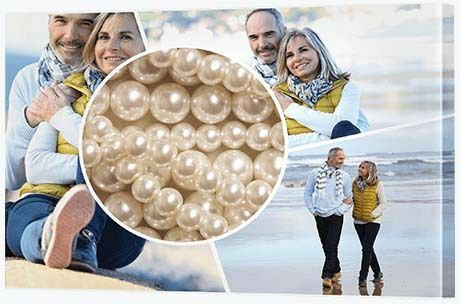 No matter, this modish collage offers a way you can keep with tradition, but mix thing up a bit with an image of pearls in the center circle and photos of the two of you together in the outside frames. There's nothing more romantic than a Shakespearean sonnet, so woo your loved one with a gift of poetry. 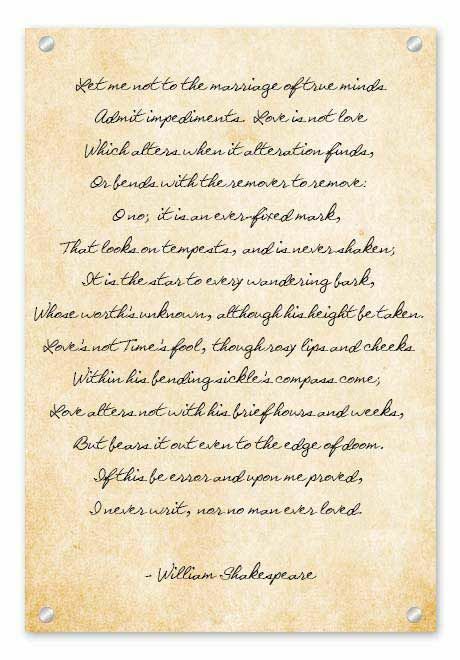 You will find an abundance of love sonnets by Shakespeare online, but the key is to find the one that speaks to your own personal relationship. Find some words that speak to your heart, design an image in Canva then print it via Canvas Factory onto gorgeous glass. You can give your print a traditional feel by choosing a sepia toned, tea-stained background color with a classic cursive font, like we have done in our example, or you can choose something more colorful and contemporary. Here are a few lines from The Bard to get you into a romantic mood. Whose worth's unknown, although his height be taken." You took close to 600 digital photographs on your big European adventure. It's time to give them the exposure they deserve. Sometimes it takes a special milestone to encourage us to recognize the good times we've had in our lives. This gift provides an opportunity to reflect, each and every day, on that wonderful holiday you shared together. 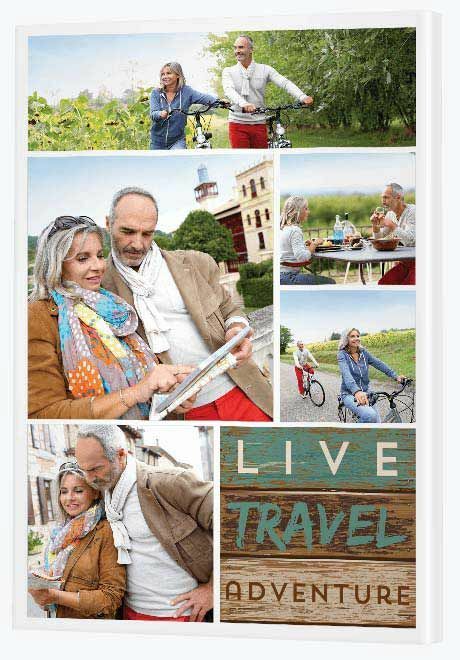 A travel themed canvas, with its rustic 'Live Travel Adventure' quote, is a wonderful collage template to use. 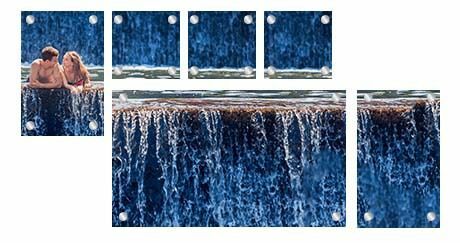 All you have to do is place your favorite snaps onto the five frames and print to canvas. If you have many other holiday memories you'd love to display, you might even consider creating a series of collages. A collage series makes for a wonderful wall display for a hallway or living area. We have over 40 different collage designs for you to consider. Bring those digital photos to life, so you and your spouse can relive those amazing moments over and over again. 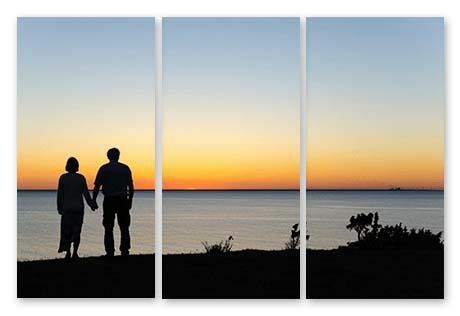 Keep romance alive with a stunning split image print featuring the two of you sharing a moment of love. Do you have a favorite place you both absolutely love to be? Split image prints are works of art that wonderfully capture sense of place, so choose a photo of your favorite place and print it across three frames. The photo might feature the two of you enjoying a moment together, but it may just celebrate place in all its pure, perfect glory. Anniversaries are all about counting your blessings, so celebrate her latest love - her grandchild - with a family focused gift. 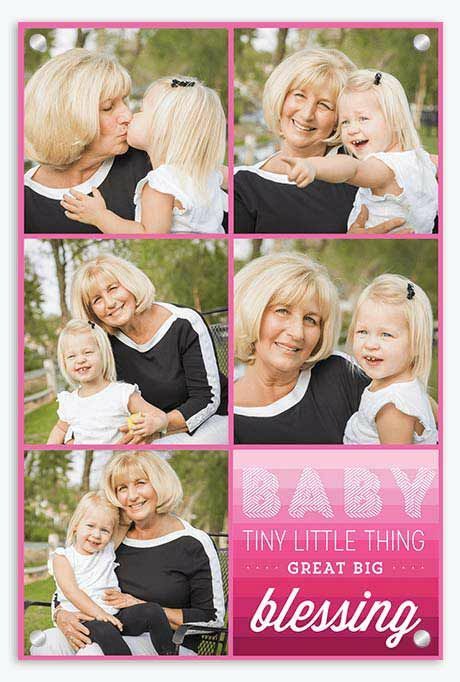 Sometimes the best anniversary gift is the one she actually wants, so take advantage of this special occasion to gift her a collage featuring her with her treasured grandchild or grandchildren. Families often get together to celebrate major milestones like this, so this is a great present for Mom (AKA grandmom!). 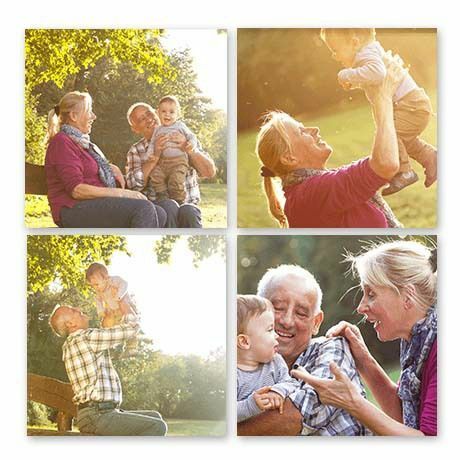 Gather together photos of her spending time with her grandkids, choose five of the happiest and most colorful in the collection then print it onto stunning glass. This themed collage template gives you the opportunity to color the border, so you can keep it a simple white or black or, as we've highlighted in the example, give it a splash of pink. Family is a blessing and a gift like this will no doubt sit pride of place in her home and in her heart. And there's no need for Grandpa to miss out! There are many different themed templates to choose from, so create a collage for him as well! Attending a vow renewal? 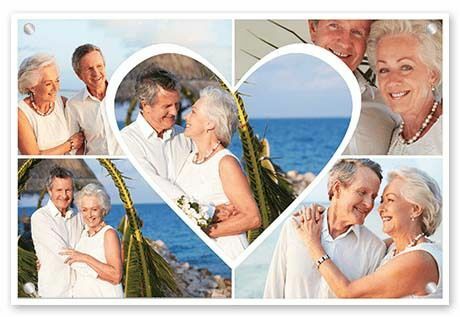 Give the faithful couple the royal treatment with a photo gift that celebrates their love. If your favorite couple - your parents or friends - are formally renewing their commitment to each other with a celebration of love, save the best gift until after the ceremony. A photo collage featuring photos of that special day will delight them more than you'll ever know. For added impact, perhaps include a few photos of their first wedding as well! When thinking of pearl anniversary gift ideas, there's no need to get bogged down in complexity. Keep it sweet and simple. Diamonds may be a girl's best friend, but pearls are a woman's. The key to gifting pearls is to think outside the traditional gift of a string of pearls, particularly if she already has a set. We're not saying deny her a pair of matching earrings, but realize it need not all be about the expensive jewellery. 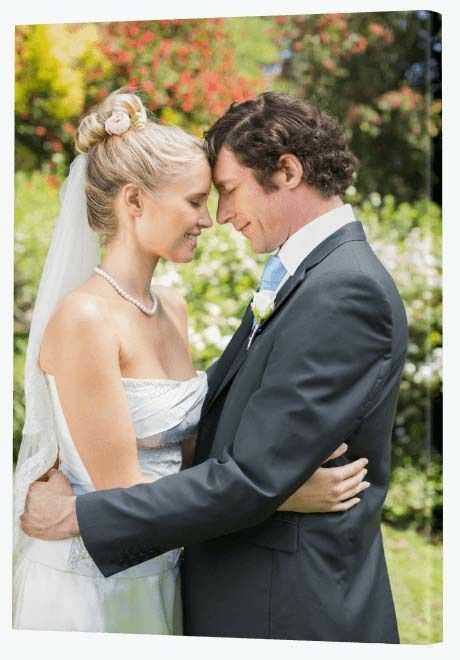 Instead, transform precious old memories into cherished new love with a touching wedding photo canvas. Find a photo from your wedding 30 years ago and give it new life by printing it to canvas. If your wife was wearing pearls on her wedding day, choose a photo that accentuated her pearls. So much love and thought goes into a present like this - and it's way better than wandering aimlessly through shopping mall jewellery stores. If you've never had your wedding photos printed to canvas, you might even like to use more than one photo. Consider a wall display or a collage. A gift like this will bring tears of happiness to your wife. Your photos and your love will both receive a new lease of life. Their love for one another is real, but their love for their new grandchild is real awesome. Want to give an anniversary present they'll hold onto for years to come? Build a wall display that celebrates their new titles as grandparents. 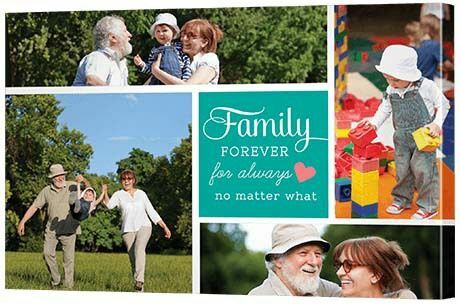 Plan ahead and prepare plenty of photos of them with their newest love, gather the best of the best together and print four fantastic photos on four frames. You might even like to use one of the frames to customize a special quote and add it as an image. Shine a light on family, letting them know everyone is by their side to rejoice in love, life and family - forever!